The Boeing EA-18G Growler is a carrier-based electronic warfare version of the two-seat F/A-18F Super Hornet. It is slated to begin production in 2008, with fleet deployment in 2009. The EA-18G will replace the Navy's EA-6B Prowler. An electronic attack version of the F/A-18F, the EA-18G Growler will replace the Navy's EA-6B Prowler. 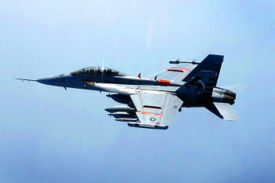 An F/A-18F "F-1" was re-fitted with ALQ-99 electronic-warfare system, and successfully completed an initial flight demonstration of the EA-18 Airborne Electronic Attack (AEA) concept aircraft flight on November 15, 2001. The first EA-18G test aircraft went into production in October 22, 2004. 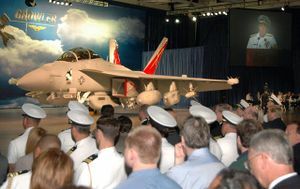 The EA-18G had a public rollout on August 3, 2006. The first test aircraft, known as EA-1 made its initial flight in St. Louis on August 15, 2006, and ferried to the US Navy's Naval Air Station Patuxent River, Maryland on September 22, 2006. EA-1 primarily supports ground testing in the Air Combat Environment Test and Evaluation Facility (ACETEF) anechoic chamber. 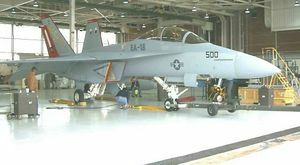 The second aircraft, known as EA-2 first flew on November 10, 2006, and was delivered to NAS Patuxent River (Pax River) on November 29, 2006. EA-2 is the primary AEA flight test aircraft, initially flying on Pax River's Atlantic Test Range (ATR) for developmental test of the AEA system before transitioning to the Electronic Combat Range (ECR, or 'Echo Range') in Naval Air Weapons Station China Lake in California. In an April 2006 report, the United States Government Accountability Office expressed concerns that because the EA-18G was apparently "not fully following the knowledge-based approach inherent in best practices and DOD’s acquisition guidance", the program had an increasing risk of "future cost growth and schedule delays". The report recommends that the DOD consider purchasing additional ICAP III upgrades for EA-6Bs to fill any current and near-term capability gaps and restructure the initial EA-18G production plans so that procurement takes place after the aircraft has "demonstrated full functionality". The US Navy has ordered a total of 57 airplanes to replace its existing EA-6B Prowlers in service, all of which will be based at NAS Whidbey Island save for Reserve Squadron VAQ-209 based at NAF Washington, MD. Regular production is slated to begin in 2008, with Initial Operational Capability expected in 2009. The Navy is planning to buy 90 aircraft in order to equip 10 squadrons. The Growler has more than 90% in common with the standard Super Hornet, sharing airframe, AESA radar and weapon systems such as the AN/AYK-22 Stores Management System. The 20mm Vulcan cannon is removed from the nose to add additional electronics (and in other parts of the airframe as well), ALQ-218 wingtip receivers are added to the wings, also ALQ-99 high-band and low-band jammers. These jamming equipments, as well as external fuel tanks, will add increased drag, but the EA-18G will have longer-range and loiter time over target area. EA-18Gs will carry AIM-120 AMRAAM missiles for self-defense, and two AGM-88 HARM missiles, or AGM-88E AARGM (Advanced Anti-Radiaiton Guided) missiles for destroying enemy radar sites. Boeing is looking into other potential upgrades, the AN/ALQ-99 radar jamming pod might be replaced in the future, and they’re looking into adding weapons and replacing the satellite communications receiver for the 2008 budget. The EA-18G can be fitted with up to five ALQ-99 tactical jamming pods and will typically add two AIM-120 self-defense missiles and two AGM-88 High Speed Anti-Radiation (HARM) missiles. The EA-18G will also use the INCANS Interference Cancellation system that will allow voice communication while jamming enemy communications, a capability not available on the EA-6B. This page was last edited on 16 January 2008, at 21:31.